The measures we take to ensure the highest standards of client security include account protection through the Federal Deposit Insurance Corporation (FDIC), the Securities Investor Protection Corporation (SIPC) and the Customer Asset Protection Company (CAPCO). But we don’t stop there. Raymond James brings state-of-the-art information technology and strict compliance standards to help protect the security and integrity of your accounts. The Securities Investor Protection Corporation (SIPC) is a quasi-governmental entity overseen by the U.S. Securities and Exchange Commission (SEC). SIPC generally insures SEC-registered securities to a maximum of $500,000, including $100,000 cash, per account. The Customer Asset Protection Company (CAPCO) was established in late 2003 by a coalition of financial services firms as a “captive insurer.” It was founded specifically to provide securities account protection for brokerage accounts of member securities firms over the maximum offered by SIPC. For a pension or profit-sharing plan to receive pass-through insurance, the deposit account records must specifically indicate that an employee benefit plan owns the funds. Coverage for an employee benefit plan’s deposits is based on each participant’s share of the plan. Because plan participants normally have different interests in the plan, insurance coverage cannot be determined by simply multiplying the number of participants by $100,000. The Securities Investor Protection Corporation (SIPC), established as a nonprofit entity by Congress in 1970, safeguards client assets in the event of a member firm’s bankruptcy or insolvency. SIPC protects the net equity of securities such as stocks, bonds, notes, options, certificates of deposit, money market funds, bonds, warrants and rights. Funded primarily by member contributions as well as by interest it earns from U.S. government securities, SIPC can also draw upon a $1 billion line of credit with a bank consortium and borrow up to another $1 billion from the U.S. Treasury. For more details on SIPC, an explanatory brochure is available upon request or at sipc.org or by calling 202-371-8300. In addition to SIPC coverage, Raymond James provides excess SIPC coverage through the Customer Asset Protection Company (CAPCO). This coverage extends to the net equity of all cash, money market funds and other securities positions for each separately registered account. Unlike SIPC, no predetermined limit on coverage exists. Instead, coverage reflects the value of your account(s) at the time of the broker dealer’s insolvency. CAPCO was established in late 2003 by a coalition of financial services firms specifically to offer securities account protection for brokerage accounts of member securities firms in excess of the maximum offered by SIPC. 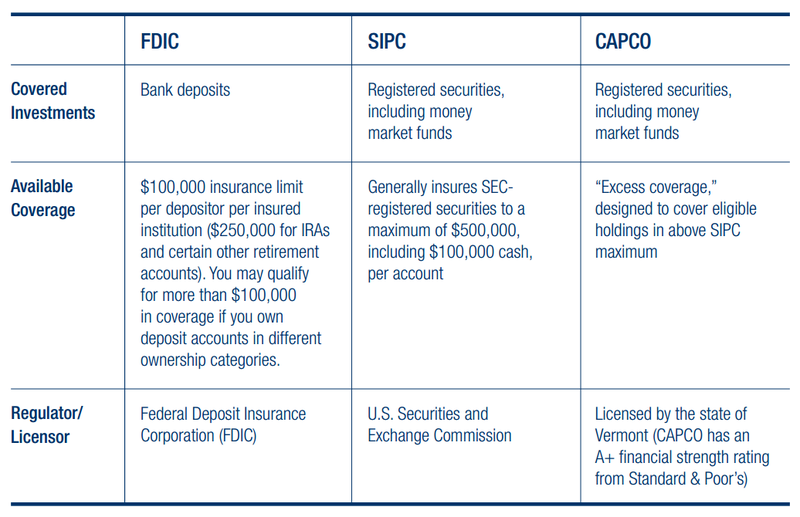 Account coverage through FDIC, SIPC and excess SIPC represents just one way we protect your account.